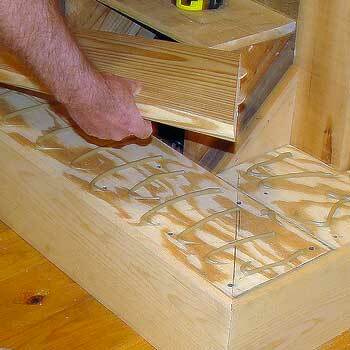 Solid hardwood treads and risers are often installed on site, built on top of the existing rough framing. Other options include having an entire system built off site then installed. 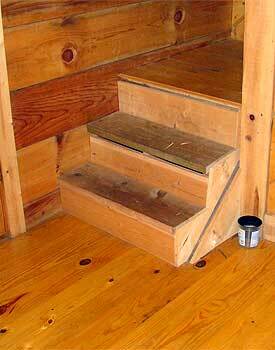 Treads and risers are generally unfinished, with prefinished options being available but often difficult to locate. 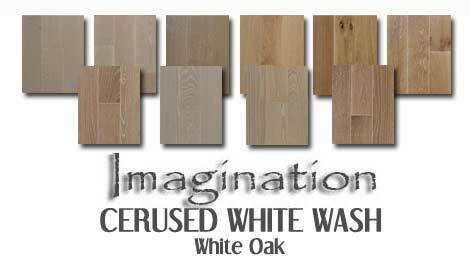 When choosing unfinished the final course of action after installation may be a light sanding and coating with a desired finish. 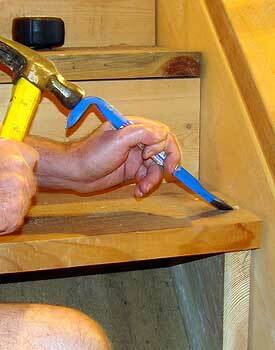 More preferred methods are finishing then installing, cutting down on time the stairways would be out of service. 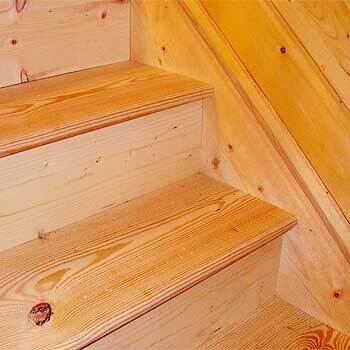 Depending on how your staircase is configured, you may only need standard treads if your staircase is closed or boxed in. 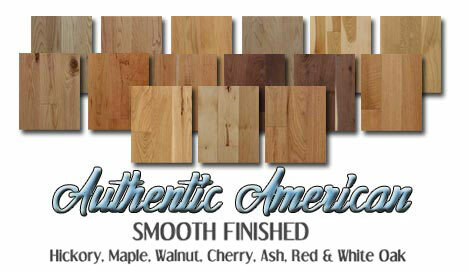 Standard is also term milled ends, or installed into a straight box or closed staircase (no edges are seen). Pictured on the right best describes the product showing a staircase with stair stringers/skirting capturing the entire scope of the system. Some situations may not have stringers, but only drywall to work with. Standard treads are measured, then cut on site to fit. Sizes: Treads will start at 36 inches and are sold in progressively longer lengths; usually 36, 42, 48, 54, 60, 72, 84, 96, and 120 inches. 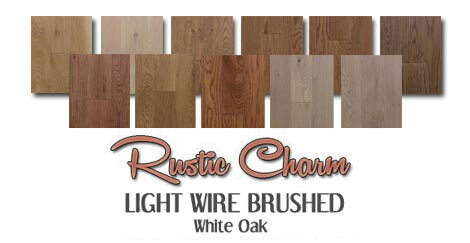 Overall thickness may vary slightly but the majority are 1 1/16 of one inch. 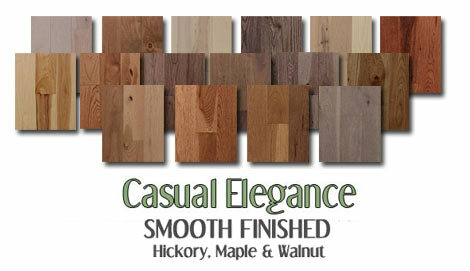 Standard finished ends are treads revealing the end of the hardwood rounded over in the same manner as the front part of the tread. 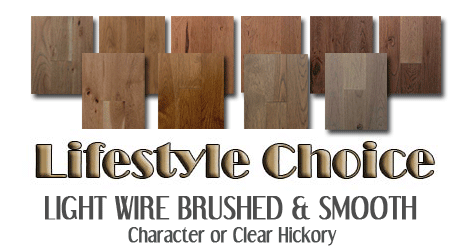 This type of tread is more economical while taking less time to install. 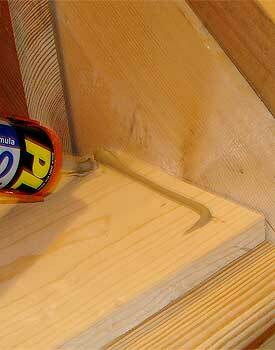 Standard treads can also be purchased for this application and rounded over with the use of a router and a standard round over bit. 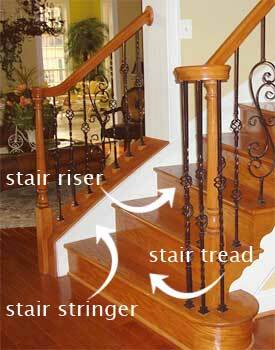 The starting step will have rounded effects on both ends or one end, depending on how your staircase is configured. 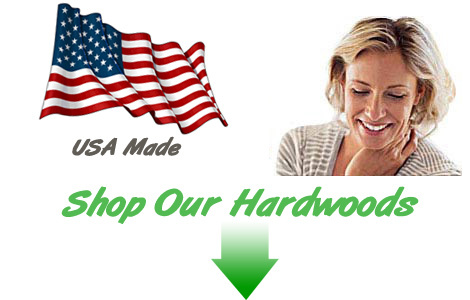 Lengths are generally sold in 48 or 60 inch lengths for common specifications. How and When Are They Installed? 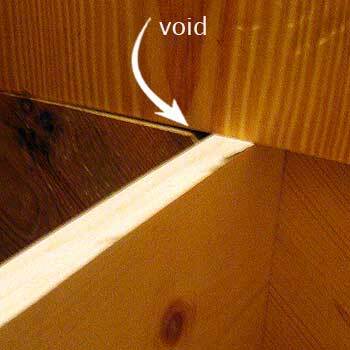 For those that may have a standard plywood substrate, or 2 x 12's used under carpeting with a hand rail system, complete removal of all would be the preferred method. This would depend on how the entire system was installed and what you want to achieve from the project. If the handrail system is separate of the existing tread and riser system, and you're happy with the existing, only treads and risers would be considered. 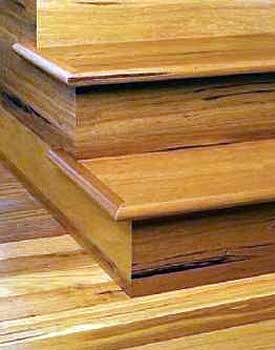 For those that desire an appearance of handrail, balusters, treads and risers all being connected, an experienced stair builder is my suggestion. I thought I'd share a project I've been contemplating for over a year, but the question was always how to go about it. My chink logged home located in the Appalachian mountains is quite rustic, but I didn't think the steps would be this rustic! This surely would not pass code in many areas, but the home was built in 1990. Anyway the photo on the right reveals the situation. These steps had been this way since day one. It's basically a roughed in staircase but the carpenters did place some flooring on the landing, excluding the stair nosing. Rise from step to step was off. I found it difficult to get started up the steps without tripping. To solve this problem the flooring was removed from the landing, with 1/2" plywood torn out as well exposing the landing joist system. The first two steps were stripped of the rough treads and risers. 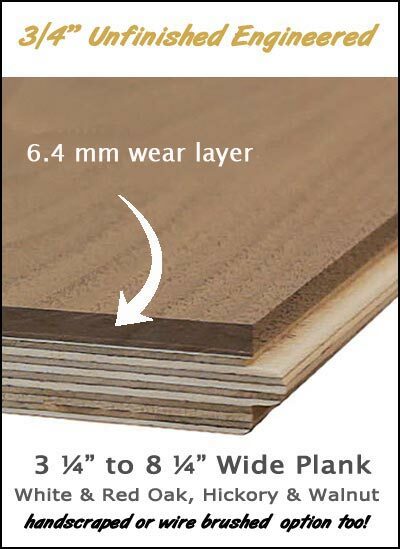 In order to get the rise more consistent a combination of 1/4" & 3/8" ply was added to the the substrate before 1 inch thick pine treads were added. 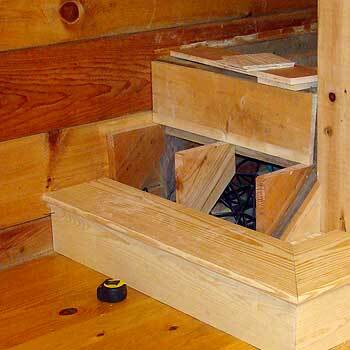 Stair builders will vary on techniques (shims) but this method proved feasible without incurring any major demolition. After adjustments were made, the rise on each step measured at 8 inches, slightly more than preferred. By boxing in the landing tread, the unsightly exposed stair case was hidden. Sorry, no pictures of this procedure. 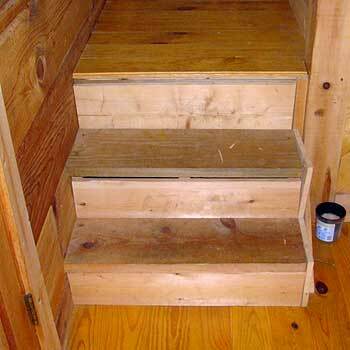 One obstacle remained to complete this stairway redo. 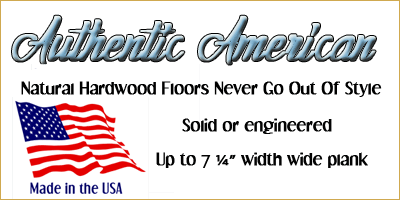 As the stairs turn on a 90 degree angle leading to an upstairs loft, the last step to the actual finished floor height will only be 6 3/4 inches. Can this be fixed? In this case it will not, but the overall improvement on the job will more than outweigh one minor problem. Planning wasn't in the cards when this place was built. 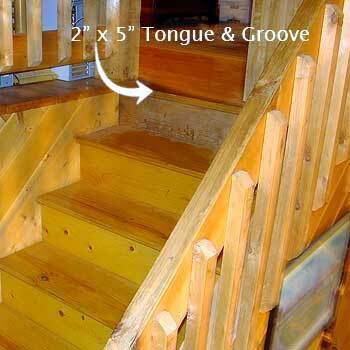 The flooring in the loft is 2" x 5" tongue and groove pine installed over exposed rustic beams that has all stair and railing components, plus framed walls on top. 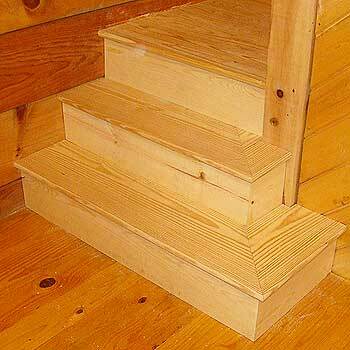 Had the rough stair case been planned properly in relation to the rise and run, problems would have been avoided. Considering it is my home office area, I'll be the only one navigating that last step. I had planned on using my Festool setup for cutting the miters on the first two treads, but some components were missing due to a recent move. Anyway the Hitachi sliding compound miter saw worked just fine, but did not cut through entirely as the board had to be flipped to finish the cut. 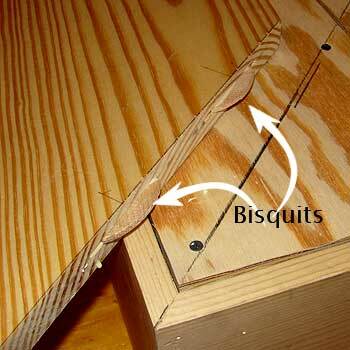 Biscuits were added to the mitered cut providing more strength to the mitered joint. Three would have probably been a wiser choice, but the entire tread was glued down to the substrate as well, so I don't foresee any movement. Our first two steps actually took more time than the rest of the staircase due to the complexity of cutting around the landing newel (post) combined with two treads and 45 degree mitered returns. Here's the gadget. It's called a nail puller. Instead of trying to pry the treads loose that can inevitably damage other areas, a simple nail puller is hammered into the tread around the nails. Once it's wrapped around the nail, pry back until its bite into the underlying stringer support is free. With six nails used to attached each tread, time involved was a few minutes. 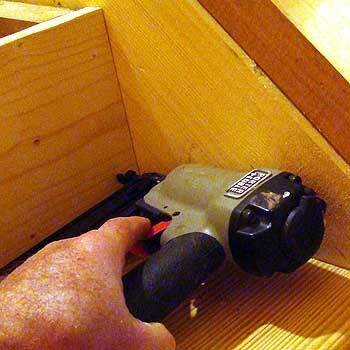 Removal of the risers was an easier task as they were only attached with one small finish nail. You will find varying methods, but in this case our risers were built on top of the tread after finding the measurement of the underlying stringer rise. All three stringers were not exact so measuring all three and transferring to a straight line and cut on the table saw was done. Before installing the next tread on top of the riser check for fit with a scrap piece of wood. The preference is avoiding any gaps underneath. For added support, PL200 adhesive was applied on the backside on the riser before nailing. 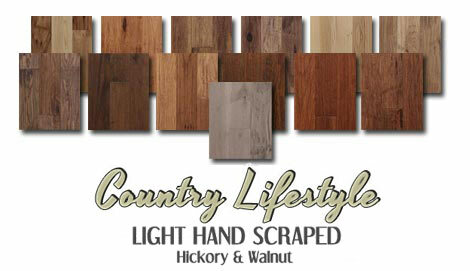 For any type of work that requires precision measuring and cutting, the old saying measure twice cut once prevails here. I generally measure twice and cut at least two times. 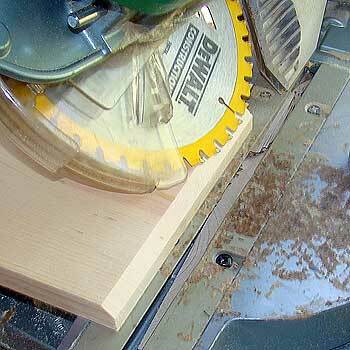 For example, if the riser or tread is 36 1/16 of an inch I prefer to cut it a tad more than that. An extra trip back to the chop saw doesn't take long, but it beats making a short cut especially if you have limited material on hand for mess ups. Here's another tip for getting those pieces into place with the least amount of gapping on the sides. 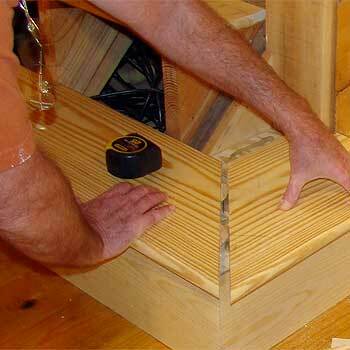 A compound miter works perfect in this case but you can just as easily use a belt sander or table saw. Flip the board over and create a bevel on the backside. This allows for an easier fit. 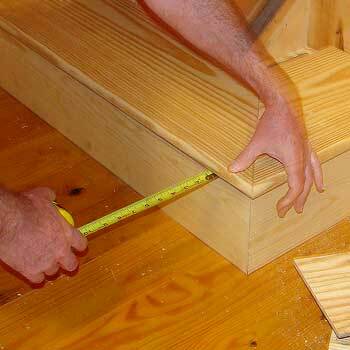 Principles follow that of risers when measuring, but a handy tool simplifying the procedure is the stair wizard. The tool is a retractable gizmo that can be placed over the stringers that gives the exact measurement of the area and compensates for angles that may exist against the finished stringers (skirting) on the sides of the steps. Once the tread is cut to fit, any voids or variances underneath can cause squeaking. Check for flatness or where the actual tread will rest once installed. Even though the tread itself is rigid at one inch thick, a liberal amount of PL200 construction adhesive before laying the tread into place could prevent potential squeaks at a later date. 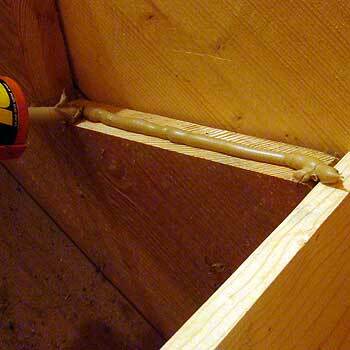 For lack of a better term, the adhesive can act as a minor leveler and absorb any minor movement within voids.